We are the UK's leading supplier to educational establishments. We offer the lowest prices, free delivery, all backed up by our award winning customer service. Our amazing range of pool tables for schools has been specially selected to offer a great selection at a variety of prices. 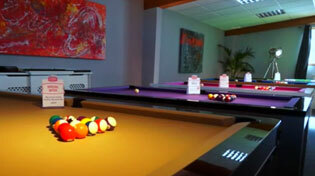 All of our pool tables come with free delivery and free accessories, and we have the lowest UK price. All of these tables are designed and manufactured by Supreme Pool, who have been supplying the pool industry with a wide selection of high quality slate bed pool tables for over 25 years, and continue to manufacture these tables in the UK. Supreme Pool are a leading force within the industry in developing and engineering table improvements to enhance playing standards and table reliability. Their tables are the choice of major championship events, where professional players and organisations insist on the best, and are endorsed by the World 8 Ball Federation and I.P.A. The pool tables themselves are made to extremely high standards, with expert craftsmen manufacturing each table and finishing them by hand. Every table in this range is perfect for repeated use, with their robust design and simple set-up. Schools, colleges and universities will all benefit from these tables, whether they are used for sports classes or common areas for students (or even staff!). Whatever you are looking for, we should have covered. If you have any queries at all, just give us a call on 0800 622 6464 and one of our friendly expert advisors will be able to help you. For the ultimate school pool table at an incredibly affordable price, the Supreme Winner is hard to beat. The Winner is a very popular choice, due to its timeless design and great playing characteristics. It features genuine 3/4" Italian slate bed and the finest West of England woollen cloth. All of our tables are designed for maximum playability and practicality, to provide you with a trouble-free game which will enhance any space in a school, college or university. All of the tables we sell are made to extremely high standards and we pride ourselves in only committing to promote and sell the very best that the UK Pool Table market has to offer. We are able to offer educational buyers payment on 30 day terms, following the delivery of your order.